Former Party Secretary of Gansu Province which encompasses a part of Tibet. Education: Studied in the Chinese Department, Guiyang City, Guizhou. Post-graduate degree from the Central Party School. Career: 24 years in Guizhou Province, rising to Party Secretary of Anhui Province, before being moved to Gansu in December 2011. Relevance to Tibet: Was responsible for part of Tibet. Member of the 18th CPC Central Committee (as of November 2012). Wang joined the Communist Party in 1979 whilst working in Guizhou. 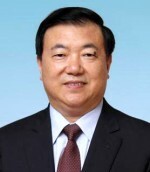 After 24 years in the Province he head short-term positions in Sichuan and Fujian, rising to Deputy Party Secretary of Fujian Province between 2002 and 2007. In 2007 he was moved to Anhui, first as Acting Governor, then Deputy Party Secretary and finally Party Secretary in 2011. He was moved to Gansu Province in December 2011, replacing Lu Hao. In April 2017 he was demoted to the position of vice chairman of the Education, Science, Culture and Public Health Committee of the 12th National People’s Congress. In July 2017 Xinhua reported that he is being investigated for “severe disciplinary violations”. This entry was posted in Profiles and tagged China, Chinese Communist Party, Gansu, Party Secretary, Tibet, Tibet Work Leading Group, Wang Sanyun. Bookmark the permalink.